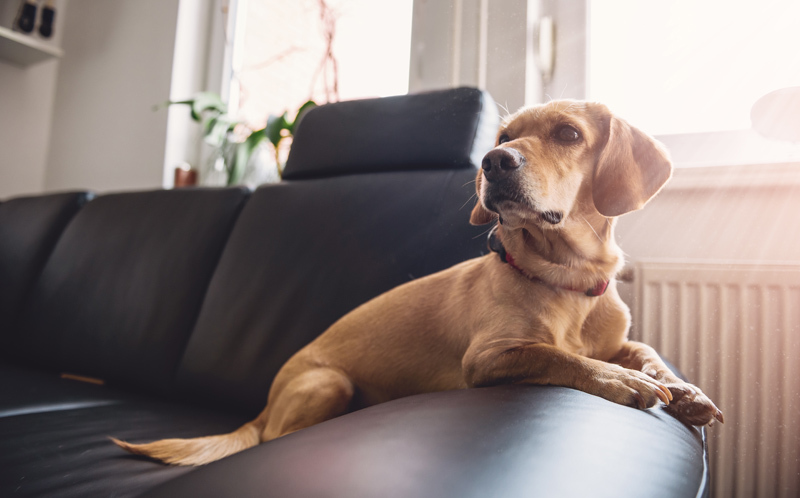 Although buying or selling a home can bring about exciting changes for you and your family, it can introduce stress for your four legged loved ones. As a seller, having strangers coming in and out of your house can be alarming and upsetting to your pets. As a homebuyer, you want your new home to be safe and comfortable for every member of your family – even the furry ones. Whether you’re buying your first home or getting ready to put your house on the market, these pet safety tips for homebuyers and sellers will help make the process easier on you and your pets. What Kind of Home Best Suits Your Pet? Consider your pet’s current and future needs when viewing potential homes. Is your pet young, old, big, small, a roamer, a digger, a jumper, a chaser? A young, active pet would appreciate a large yard whereas an escape artist might need a high backyard fence. A mid-life to senior pet could be spared mobility issues later by living in a single story home with no stairs. Double Check Outdoor Decor. Your new home might come with lovely landscaping and an entertainer’s dream yard complete with swimming pool, but is it safe for your dog or cat? Make sure the plants and flowers around your house are non-toxic to pets, and consider replacing beauty bark and decorative gravel with larger scale materials that are impossible for pets to swallow. Swimming pools and spas pose a grave risk to pets unfamiliar with such things, so make sure they are fenced or covered when not in use. Create a Safe Room. On moving day, it’s easy to lose track of where your pets are in all the bustle and confusion. At your old house, contain your pets in one quiet room where they will be out of harm’s way and unable to escape an open door or gate. Do the same in your new house when transferring your belongings there. For especially nervous or shy pets, you may opt to keep them in the safe room for several days so they can decompress from the stress of all the activity. Before letting pets have free rein of the new house, do one last walk through to make sure nothing dangerous was left in any of the rooms or the yard. ID is Crucial. Many pets become lost in the time period surrounding a move; firstly, because of all the distractions and the many opportunities to escape; and secondly, because they don’t know their new surroundings. If your pet gets lost in your new neighborhood, he may go back to your old neighborhood expecting to find you. If you’re moving cross-country and your pet escapes during the move, he could end up anywhere, which is why it’s so important to have a microchip and visible ID on your pet at all times. Make Your Pet’s Presence Known. While some home sellers may temporarily relocate to another property while their house is on the market, for many, this isn’t feasible. So make sure your real estate professional knows there is a pet on the premises and ask that this information be included in your home’s listing details. You may also request that agents call first before visiting your property, or show your home by appointment. Your real estate professional can help you determine the best approach to take. Make Yourself Scarce. When you know you’ve got a potential buyer coming to view your home, it’s a good idea for you and your pets to leave the premises or become as inconspicuous as possible. Take your dog for a walk, or ask a friend or neighbor to temporarily pet sit during the property showing. If your pets must stay in the house, another option would be to contain them in a carrier or pet cage in a low traffic area (not the kitchen, bedrooms or bathrooms as these rooms are ones buyers definitely want to see). Never Leave Your Dog Alone With Strangers. Dogs, no matter how friendly, should never be left alone and uncontained at your property when a potential buyer comes to call. Aside from the fact that this poses a huge liability issue for you should something happen, not everyone loves pets, and a barking or excited dog could be enough to cause a potential buyer to move on. Keep ID on Your Pet. Make sure your pet wears a collar with visible ID. If your pet gets out during the showing or moving process, the easiest and most effective way for the finder to get in touch with you is by looking on your pet’s collar and finding your current phone number. Microchip and Register Your Pet. As a failsafe in case your pet loses their ID, make sure they are microchipped and your corresponding information updated in a universal database such as found.org in the US, or petchipregiststry-ca.info in Canada. This post is intended for informational purposes only and should not be taken as professional advice. The point of view and opinions expressed in this post are those of the author and do not necessarily reflect the position of Realty Executives International. This post was written for Realty Executives by Estelle Weber, a freelance writer living in Los Angeles. You can read more of her work here.